Company “Bastion” is the biggest enterprises in Ukraine, specialized in processing of fresh and fresh frozen fish and seafood products. Company was organised in 1997. Nowadays, Company exports fish products to more than 20 countries. Because of long experience, JSCompany “Bastion” has a high rating in Europe, USA and countries of CIS. 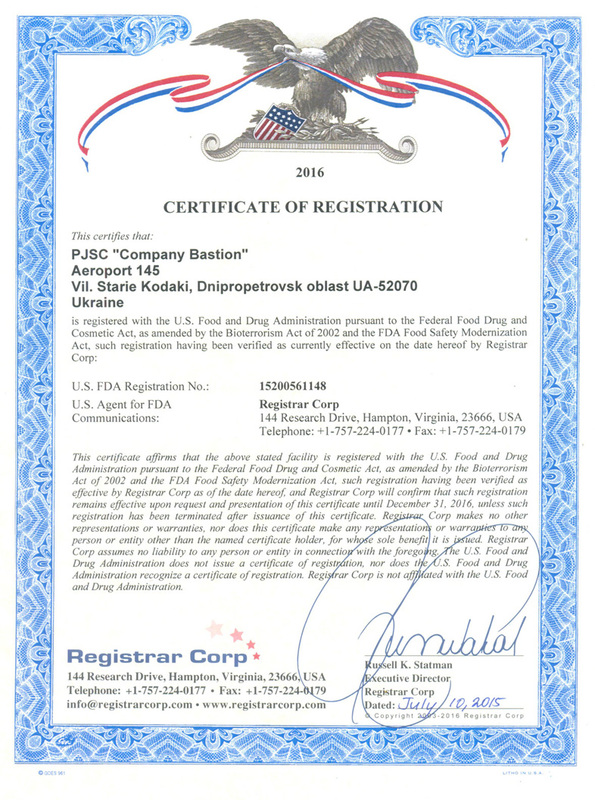 On a domestic region the Company’s production is well known under the trademark as “НашаFishка". The assortment of products is constantly enlarged. The production is oriented for processing and production of fresh frozen products as fillet, stuffing, fresh frozen caviar. We use various kinds of fresh and cooled fish for processing. The used method of “shock” frozen allows to keep for a long time the nutrition and energy product worth. The special attention is given to the improvement of professional skill of the personnel. The special program of promoting of perfection of professional skills of workers of the enterprise is developed in the company. The technology of packing of a fish in vacuum packages is unique for Ukraine.